This is a lengthy and multifaceted review. There is a summary at the end. I have accumulated well over a quarter-century of experience in Rose Harbour and I’m very familiar with this community’s fascinating, eccentric inhabitants. I own and operate a small sea kayak outfitting business that works closely with Götz and Susan in Rose Harbour. Since I have a business relationship with the proprietor of the Rose Harbour Guest House, I do not qualify to post a TripAdvisor review for this establishment. I respect that. Most of my kayak tour guests spend a night at Götz’s guesthouse and enjoy a meal at the dining space near Susan’s house. Some of my tours are based in Rose Harbour for several days. Year after year, my guests and I have awesome experiences here. Guests of Rose Harbour are warmly welcomed as temporary members of this remote homesteading community. Integrating into Rose Harbour is like passing through a portal that spans the threshold between the “default world” and the “real world". It’s entirely possible to enjoy Rose Harbour without fully embracing the self-sufficient homesteading lifestyle. Yet, if you’re at all inclined to delve into sampling a delightfully alternative way of being, Rose Harbour can offer so much more than excellent food and a warm place to sleep. Rose Harbour offers an authentically alternative coastal experience. Those who prefer more of a mainstream holiday may not find what they are looking for in Rose Harbour. Developing realistic preconceptions can make the difference between participating in an incredible Rose Harbour experience, or contradicting an eccentric guesthouse proprietor. Götz is the proprietor of the Rose Harbour Guest House. He wears many hats, including those of an accomplished musician and remarkably self-reliant wilderness homesteader. There are guest rooms within his house, as well as within the entirely separate guesthouse. Those enjoying multiple days in Rose Harbour generally stay in the detached accommodation. Visitors who stay only one night may be provided a guest room inside the proprietor’s house. In regards to room cleanliness, the proprietor has higher standards for his guest rooms than for his own personal spaces within his home. All guest areas are properly cleaned once visitors depart. However, the kitchen in the proprietor’s own house sometimes appears to be a multi-purpose workshop/laboratory. All sorts of projects exist in various stages of completion. Keep in mind that this is not where food is prepared for guests. Meals are prepared and served at a dining space near Susan’s house, a short walk from the guesthouse. Susan has retired as primary cook and now focuses her time on her vast organic garden. A talented local chef and staff are hired during summer months to continue providing quality meals in Rose Harbour. The menu includes locally-caught fish and all sorts of organic vegetables from the gardens. Fresh breads, muffins and cookies are baked regularly. The dining atmosphere is genuine and delightful; this is not a restaurant, it’s a thriving homestead. Food preparation surfaces are kept clean and the kitchen staff practice hygenic food handling. As mentioned earlier, this is an authentic coastal experience. Some of the residents occasionally work without footwear. Before preparing peppermint tea to serve with dessert, the cook may walk barefoot into the garden to pick some peppermint. People commonly appreciate the fantastic flavours steeped from the freshest mint they’ve ever experienced. Desserts are often garnished with berries picked fresh from the gardens. Götz is remarkably knowledgeable, forthright and sometimes opinionated. Most of my guests have a limited amount of personal interaction with Götz, as we are out kayaking and exploring much of the time. Götz’s summertime homesteading chores keep him fairly busy, so we often only see him for a few moments during mealtimes. However, if you’re willing to engage in a depth of conversation with Götz, it’s possible that you may come to believe he talks too much. He possesses a particular genius. His ability to coherently articulate intricate concepts is nearly unmatched in my experience. This brilliant and well-spoken man will align himself with higher truths if they are intelligently presented to him. He will listen intently if you offer him something meaningful and appealing. I’ve witnessed fascinating conversations that have resulted in Götz changing his opinion, though the transformation may only be apparent the next day; after he has carefully pondered the freshly introduced concept. Rarely, a person may initiate a conversation with Götz while believing; “this isolated hippie will only benefit from hearing my superior world view". This style of approach may lead to an explanation of the profound disconnects separating a “default world view” from a “real world perspective". People often find this topic meaningfully worthwhile; there are those who experience pivotal moments as a result of hearing Götz’s bold, unvarnished truths. Some conversations with Götz may be frustratingly difficult to form rational counter-arguments to. I have unfortunately seen a few people resort to Ad Hominem tactics, sometimes only later, online. If deep, meaningful and possibly challenging discussions are of interest to you, then you may enjoy exchanging intellectual concepts with Götz. Many guests prefer to keep the topics fairly light, while enjoying Götz’s numerous other entertaining qualities. Thankfully, Götz’s conversational talents predominantly consist of genuinely friendly and animated story-telling. He has a vast repertoire of thoughtfully insightful material which he is capable of presenting in a cleverly humorous fashion. It is generally not difficult to encourage him to share his many personal stories. He is also a very knowledgable interpreter of the unique natural and cultural elements within Gwaii Haanas. Rose Harbour has no air conditioning, or electrical outlets in guest rooms. Windows open to fresh air. Since mosquitoes may gather outside at night, I suggest closing windows at dusk. Guests are provided with solar-recharged table lamps. Bringing your own headlamp is suggested. This is a remote location with limited indoor space; rooms may be shared. Some upstairs rooms have very steep stairs. If you don’t want to navigate the stairs, you may request a ground floor room. Rose Harbour has no flush toilets. Clean, well-maintained composting outhouses and toilet paper are provided. If people rapidly consume paper, the stock can quickly diminish. More will be provided if you ask. For my own guests staying in Rose Harbour, I simply issue them a private supply. Bringing a roll of your own is a good idea. 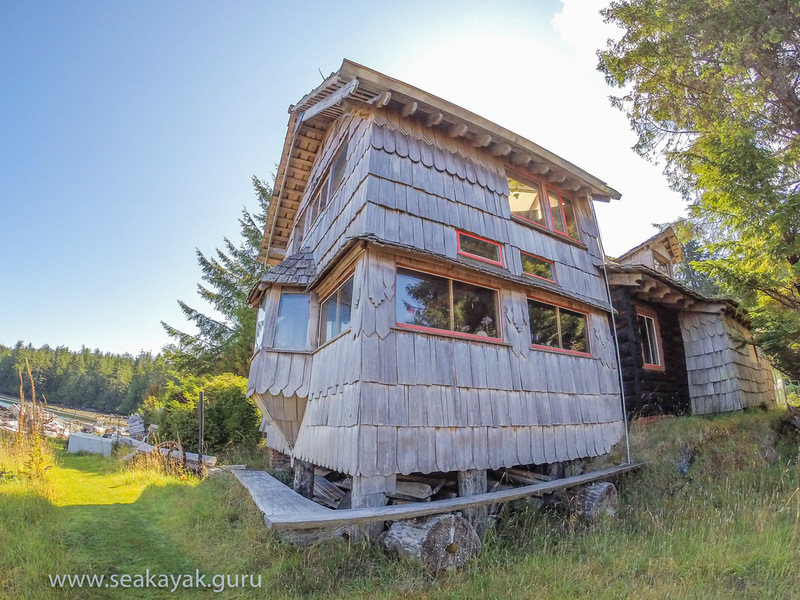 Götz’s house and his separate guesthouse were hand-built from beachcombed logs, milled onsite. Some of the finishing consists of cleverly repurposed salvaged materials. Even the wallpaper has a unique origin. Each household component seems to have an interesting story; ask Götz how he moved his piano into his house. These are just a few of the impressive aspects of this craftsman-built remote outpost. Years ago, there was an unpleasant flu that seemed to exist for some days in Rose Harbour. It’s possible that an infected traveller had left the bug and it found host in one or two residents, as well as a few subsequent visitors. I’ve seen this occur in a few places throughout my world travels. When it occurred in Rose Harbour, I was impressed with the clear call to action demonstrated by the community’s inhabitants. They went through each guest room and communal area with a clean cloth and a bucket of soapy bleach-water to disinfect every surface a person would likely touch. The flu was contained and extinguished. One day upon my arrival in Rose Harbour, I was immersed in the somewhat humorous drama that ensued after a guest had lodged a complaint regarding an unpleasant aroma in her room. Unfortunately, the guest had communicated her concern only after leaving Rose Harbour. Subsequently, several residents of Rose Harbour were urged to conduct comprehensive sniff tests throughout the guest rooms. Results were consistent and conclusive; no offending aroma was detected. Many possible explanations for the puzzling complaint were discussed at length. I recall a trip when a guest complained that their kayak stunk. Upon examination, it was discovered that the guest had collected a beautiful, tiny starfish that had washed up and expired on the beach. They picked it up and placed it in their kayak. The starfish looked a lot better than it smelled. I was grateful to have had the opportunity to investigate and resolve the situation while the guest was still with us on the trip. The mysterious case of the guest room aroma complaint was never solved. No further complaint on this topic has been received to date as far as I am aware. Rose Harbour Guest House is unique and not to be compared with a hotel, or with most other guesthouses. This is a rustic wilderness facility embedded within a small, authentic homesteading community. Rose Harbour residents welcome visitors, yet they do not have the resources to offer the same style of customer service one might expect from an all-inclusive resort. 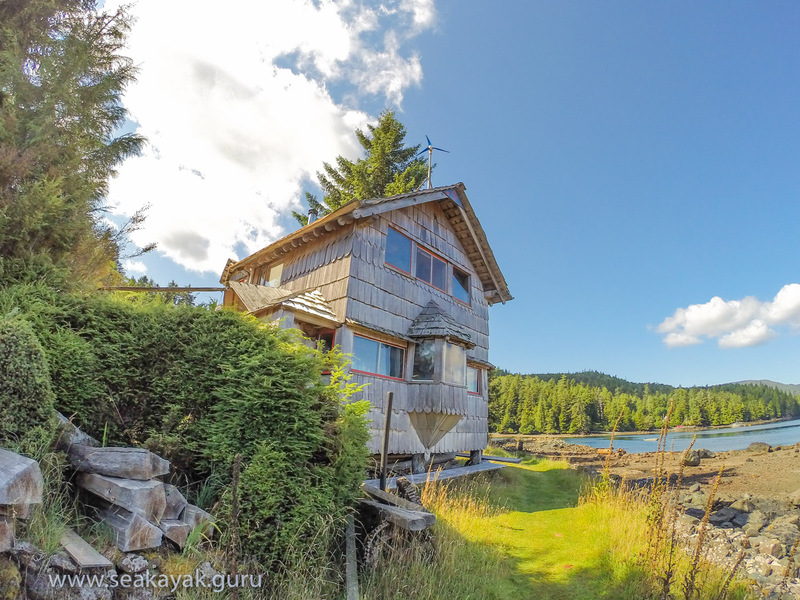 Rose Harbour provides an alternative vacation in a spectacular, remote coastal setting. I give the Rose Harbour Guest House a four star review across all categories except meals and location, which I consider solid five star ratings. Every year I see improvements and I commend the Rose Harbour community for continuing to provide quality experiences to guests. I know that when people arrive with accurate expectations, they enjoy exceptional vacations here. Rose Harbour Guest House has its own website, with a page full of comments from guests. They are worth viewing.